Have NHL coaches become overly defensive? Is there too much defense in the National Hockey League? Wouldn't it be better if teams with offensive talent just "let 'er rip" against opponents of perceived lesser offensive talent? No and no are the correct answers. Just look at last year's final standings. The team that allowed the fewest goals during the regular season (184) was the Detroit Red Wings, who won the Stanley Cup. Their opponent in the Stanley Cup Final, the Pittsburgh Penguins, were third-best in the Eastern Conference, behind the New Jersey Devils and New York Rangers, allowing only 216 regular-season goals. Of the 10 teams that allowed the fewest goals, only the Vancouver Canucks and Columbus Blue Jackets failed to make the Stanley Cup Playoffs. Of the 10 teams that allowed the most goals, only the Ottawa Senators reached the postseason. There was a team that was famous for running the opponent out of the building, the Montreal Canadiens that won the Stanley Cup five-straight seasons from 1956-60. They were so good, particularly on the power play, that the rule was changed to allow the penalized player to return after a goal was scored. That was to prevent the Canadiens from scoring two, three or four goals on a power play. But their greatest player disputes that the Canadiens were a one-dimensional offensive juggernaut. "We could score, yes, but we also had the best defense in the League with Doug Harvey, Tom Johnson and Jean-Guy Talbot," said Jean Beliveau. "Our defense was good at getting the puck and starting the offense going the other way. And our forwards were also very good at battling for the puck." John Stevens coached the Philadelphia Flyers last season to a remarkable 39-point improvement in his first full season behind their bench. Stevens was an NHL defenseman who won the AHL Calder Cup as a player and coach. "Why not go all out if you're the best team? It's an interesting question," Stevens said. "Puck possession is the answer. You want the puck. You don't want them to have the puck. The whole idea of puck possession is how good are you when you have it? If you play good defense, you get the puck back quicker. You play good defense to get the puck back." "A lot depends on the personality that you have," said Dallas Stars coach Dave Tippett. "If you think that you can win regularly, 13-12, go for it, but that's not the reality of the business. You have to have a healthy balance of offense and defense. You can't win the game unless you score but you also have to defend when you do score to get the results you want." Tippett is regarded as one of hockey's foremost defensive strategists. He was an excellent defensive forward during his 11-year NHL career and he came to NHL coaching prominence as an assistant coach for the Los Angeles Kings in charge of the power play and penalty killing. 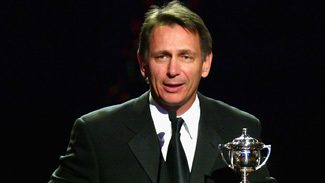 The Kings made the Stanley Cup Playoffs in all three years that Tippett served as an assistant coach. The Stars hired him six years ago and have made the playoffs every year, won two divisional titles and have never had fewerthan 97 points at season's end. The internal numbers tell the story. Under Tippett, the Stars have finished, in order, sixth, 20th, ninth, 21st and eighth on offense in the NHL. No consistency there, right? But on defense, the Stars have finished third, second, sixth, second and sixth in fewest goals allowed. They have had positive goal differentials in those years of 76, 19, 47, 29 and 35. Clearly, playing good defense has paid off for Dallas during the Tippett era. Before he coached in the NHL, Tippett led the IHL's Houston Aeros to the Turner Cup championship. "There have been times in my coaching career when I had teams that I had to expand the growth of that team," Tippett said. "When I coached Houston in the minors, they were by far the best-scoring team in the IHL. They were similar to the early years of the Edmonton Oilers dynasty in that they could outscore anyone but it wasn't until they learned to play defense and could win the game on both sides of the puck that they won championships. "We promote skill as much as anything but you have to be able to defend. I look at playing good defense as being just as much a skill as scoring because the game is about winning." NHL coaches are in agreement that the forecheck is one of the key defensive strategies. By sending your player hard after the puck carrier in his defensive zone, you force the puck carrier to make a decision to pass or to try to skate around the forechecker, the latter maneuver almost universally panned by coaches. "For me, the beginning of any system of play is keeping the puck out of your own end. When you have a good forecheck, you spend less time in your end," Stevens said. "We need to be good defensively in our own end, get out of our end and manage the puck through the neutral zone to create an offensive attack. "The whole point of the forecheck is to come up with the puck on the offensive side of the red line and not allow the other team possession of the puck past the red line." Some teams put added pressure on the team with the puck by employing a two-man forecheck. That's a riskier defensive option, but when it's successful, it gives your team a passing option in the transition. "It basically depends on the team we are playing. We'll use a one-man forecheck most of the time, but sometimes we'll use the two-man forecheck," Buffalo Sabres center Daniel Paille said. "If we get the puck in there, we want to get it first and if we don't, our response depends on the team that we're playing against." There are different situations in which the forecheck is employed. The most common involves a turnover in your offensive zone. Your players need to get back in defensive positions while one of them forechecks to slow the attack. In another common situation, a team that is due a line change dumps the puck into the offensive zone and races to the bench while their substitutes flood onto the ice. Paille's coach, Lindy Ruff, another good defensive player during his career with the Sabres and New York Rangers, is the longest-serving coach in the NHL. His teams have always featured high-tempo skating and a hard forecheck. In determining which player does what on the forecheck after a dump-and-change, it's more about who goes first than who plays what position. "The first guy onto the ice has the far-side assignment. Obviously, start in the middle and work over there," Ruff said. "The next guy has the middle and the last forward onto the ice covers the near side. Obviously, we want to fill the most dangerous part of the ice first. "If puck is behind the net, the first player onto the ice has that assignment. Typically, if they're behind the net, you're set up in front of the net and those two players who are coming onto the ice pick up the outside linemates." Coaches have been known to devise a forecheck that forces the opponent to pass into an area that the defensive team prefers. When Scotty Bowman coached the Detroit Red Wings in the mid-1990s, his teams were renowned for the "left-wing lock," that is, forcing the offense to go up the left side. Several analysts suggested Stevens was forcing teams last season to attack his team on the side of the right defensemen. There, they would be met by rugged defenders Derian Hatcher and Jason Smith or superb puckhandler Kimmo Timonen, one the NHL's best players in transition. Stevens is breaking in a new system this season with the loss of Smith and the possible retirement of Hatcher, who is rehabilitating his knee. He wasn't thrilled to be discussing publicly his strategic moves, which must be flexible and ever-changing to stay ahead of opponents who study video daily. "That's not necessarily true, what we did last year," Stevens said. "In our instructions, we were not restrictive to one side or the other. Our forecheck was designed to get pressure on the puck on either side of the rink and everyone knew their responsibility based on which side the attack came from. Sometimes, we would try to get the match we wanted but as a general rule, we were not confined to one side or the other." Tippett suggested that while teams make a strong commitment to defensive hockey in order to create transitions that lead to scoring opportunities, there are times that it's wise to put the pedal to metal, run-and-gun and produce some old-fashioned firewagon hockey. "There is a certain element to momentum changes," Tippett said. "When you grab momentum, instead of laying back, you go after a team." And, then there are times that you don't. "When my teams are protecting a lead in the third period, there should be no drop passing, no blind passing, no tossing the puck forward from behind their goal line," Tippett said. "Be disciplined and keep the percentages in your favor. The plays you got away with early in the game aren't there now because they have a high degree of risk. Do the things that make you win." Everyone should have a dream that they can follow. Tippett has his. "I'd love to win every game, 10-0, because everybody would be happy and we'd know that we defended well."